…evaluating #18M and the European Blockupy process, building perspectives. – Blockupy international goes on, continuing and developing its collaborating structures. – The next coordination meeting will be on the 4th of July in Padua, Italy. Save the date! More info will follow soon. 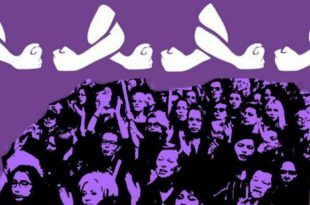 – There will be a larger Europe-wide meeting in autumn (end of September/early October), possibly in Athens in correspondence with the Solidarity for All festival. – We want to prepare a transnational Blockupy event in late autumn. Each proposal by networks and groups for this event should be written down before the next coordinating meeting in July (including strategic questions, steps to be taken, networks and groups willing to take responsibility etc.) in order have the instruments to decide on common actions/events/projects in late autumn and to prepare the Europe-wide meeting. There were approximately 50 people from transnational networks, political groups, trade unions and political organizations from various European regions and countries – Austria, Belgium, Poland, France, Germany, Greece, Ireland, Italy, Netherlands, Spain, UK – most of which had participated in Blockupy International, the coordinating group and March 18th in Frankfurt: Beyond Europe/umsGanze/Plan C; Transform Europe; D19-20 (Belgium); Transnational Institute (Netherlands); Attac (France, Germany); Solidaire (France), interventionist Left, NoTroika, No One is illegal (Germany); DinamoPress, Precarious Di∫connections, Global Project, various social centres of Northern Italy, Esc Rome, Euronomade (Italy); European Alternatives, DIE LINKE (parliamentary groups, Hessen, party board, Germany); European Left party (Germany, Ireland), SEL (Italy); Diktyo. Network for social and political rights (Greece); Rising tide (US). Part 1: Evaluation of March 18th in and through networks, regions, currents. 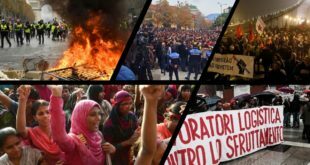 – Blockupy and March 18th have been a political success. Blockupy took place and achieved a transnational mobilization in the political escalated climate of the Euro-crisis. Blockupy’s influence should not be underestimated. There are various political spheres in which our message and strength was recognized. Resistance has reached the heart of the European crisis regime, a political message was sent – especially to Greece – and got to the people struggling in all the different spaces in Europe. Plus, through Blockupy “Europe” as a political issue and space is much more recognized as a political question. 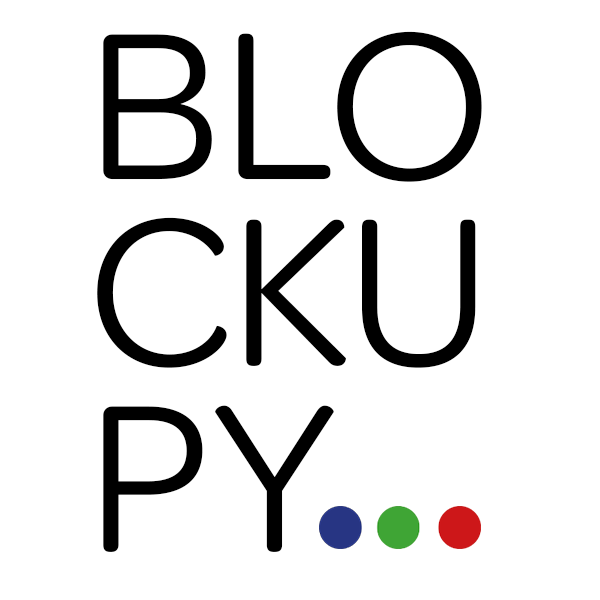 – Blockupy stands for a broad left movement that links various forms of activities as well as tries to connect mass protest and civil disobedience. Blockupy established this form of civil disobedience and action consensus with the goal for mass participation. Not all actions that took place in the morning went on as planned and agreed upon. – Hybrid form of coalition (in regard to the transnationality and hybridity of political forms of the actors) is a political challenge, a political obligation and chance. That means to take the differences/hybridity seriously, take care of it, to also learn more about respective contexts of “political efficacy”. Everybody agreed strongly to continue with the process of transnational networking and growing as a movement. – The general European political situation is not over (blackmailing of Greece, austerity, debt …) , and Germany is still the centre of EU capital. We have to relate to the European speed of crisis and we need an orientation for next steps, even if we recognize that ECB is still a crucial target. – Blockupy has been a transnational process (partially enabled because we made the best out of the postponements of the ECB opening). However, the heart of it has been the (temporary) project of the ECB non-opening: a project with a political impetus, target and with a goal of common street practice. 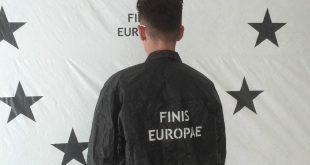 – The discussion about actions and choreography is still ongoing and has to keep into account the presence of other “external” actors for future events. 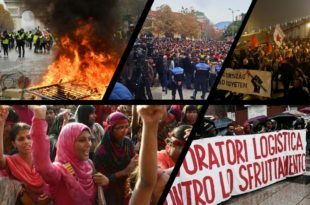 – European dimension: Blockupy became a label with substance and is regarded as an actor in the European political space, both as a coalition of different movements, parties, actors, regions and as a space and actor itself. We appear to be able to strategically intervene in discourses and act on the street simultaneously – this seems to be attractive for very different networks. 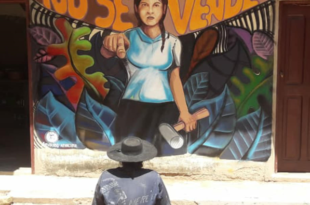 We do not aim to turn Blockupy into an organization, but we have to take seriously that we are perceived and recognized as actor, who can intervene and act. We always attempted to connect these discussions with actions. 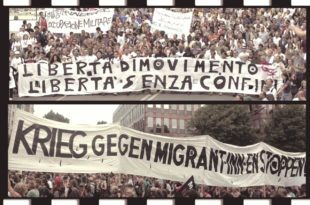 – Blockupy took Europe as a serious space of common action. The continuity of the process is valuable. – We started to share a common vision, a common political message of what we want, and a counter-narrative to European status quo. There is a need to keep doing so. – Germany has been the core of Blockupy: this is a limit and a potentiality from which to start. We need to sharpen our political discourse going beyond the rhetoric of centre vs. periphery and see the inner borders within every country/city. – After 18th march we succeeded in speaking with a single voice, we should continue with this. – We have several political ideologies, but we share common practices, also inherited from the global movements since 2011 (Occupy, Indignados…): open process, working via consensus and so on. This openness in taking the streets is a feature of Blockupy and should be continued. – Another success was the flexibility to allow local groups to act in their way. Every group has its own priority and signature in realizing Blockupy actions/plans. And flexibility did not diminish the continuity and stability of the Blockupy process. Issues beyond the ECB: austerity regime and/or a broader range of topics? – In order to renovate the basis pact of our coalition: we need a new project. The crisis regime is not over and not stabilized. 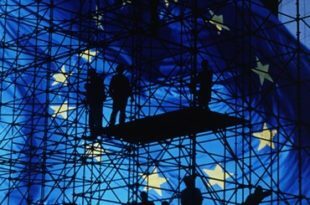 The European project from above is not as stable as the elites make it out to be. We have to intervene. Germany government is in various meanings central. We need a discussion of how we follow this further development which does not mean a stabilization of the crisis regime. – While we need to focus on the crisis regime, we also need to relate to the networks and groups dealing with daily struggles. – Open questions: How to bring all this together without separating the general discourse and the concrete practices? Regarding the working structure of Blockupy: how can we invite these groups more than in the past to work inside and together with Blockupy? 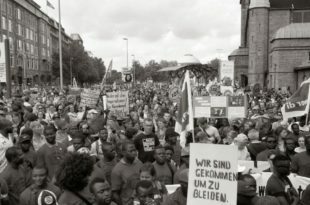 Blockupy as a German and International project – question of re-organizing Blockupy? – Blockupy is both a German and an international mobilization. While asking what Blockupy should do next, we should also ask ourselves how we are imagining the European public space as a space of social movements. We should not just go event by event, even if they are really important, and try to set our own agenda independently of the institutional one. Hybridity of space and topics? 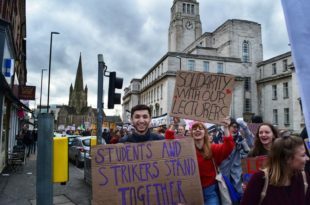 – We were a space of mobilization and direct actions, hybrid and unique. Our common orientation should be to undermine the very fundamental norms of the EU and to create a continuity of the tremble that we created. Blockupy cannot be a social forum. We cannot assume all the events happening in Europe, but we can focus on some main themes, which can be filled by the heterogeneity of our political cultures. – Blockupy was able to bring movements of different speeds/levels of discussion/ levels of experience and action together around the European crisis regime. Blockupy was not only preparing events and discussions, but it had the possibility of a certain kind of rupture. Actions and discussions made Blockupy attractive. Thesis: The responsibility of Blockupy is to act now, within the dynamics of crisis and resistance. A strong message and reliable actions encourage groups to join Blockupy to empower their struggles. – We must not miss an opportunity of addressing the present situation now in our actions. In the next months we’ll need to focus on Greece, the role of the EU institutions and the EU member states in the crisis management, and support the transnational resistance against the crisis regime. – On concrete aspects, most important are understandable and inclusive messages and actions of Blockupy. Which are the right places? 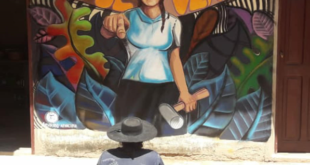 Thesis: Blockupy needs time and space in order to broaden itself and to address the subjects of transnational struggles: precarious and migrant workers, feminists, activists against evictions, racism, privatization. 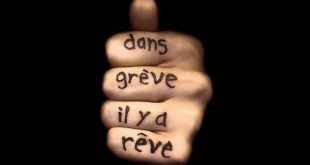 – After ECB, next objective is not easy to find. Necessity to expand the network, not to reinvent Blockupy. Necessity to address the austerity on the level of everyday life. – The European border regime is an essential features of the crisis regime, not only because migrants belong to the most affected by the crisis but also because mobility is one of the crucial points to understand the European space and to take action.